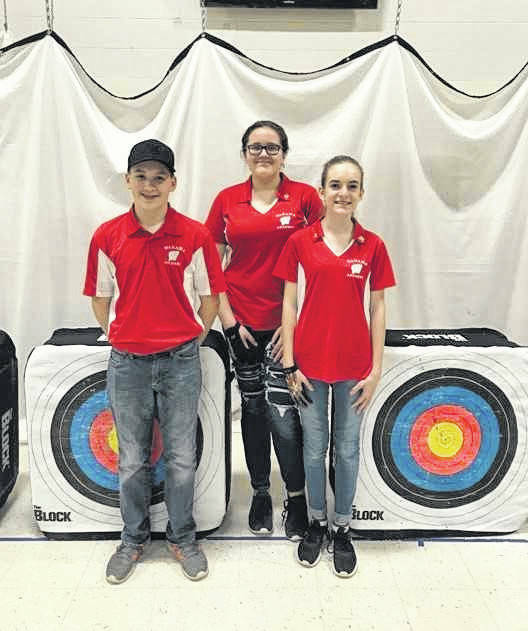 MASON — Three Wahama Archery Team members have qualified for the 2019 West Virginia State Archery Tournament, to be held at Marshall University on March 30. The archers qualified for the state tournament from their scores shot at a virtual tournament held recently at Wahama. Out of a possible score of 300, Chloe Robinson, an eighth grader and second year archer, shot a score of 277; Loryn Weaver, an eighth grader and first year archer, shot a score of 275; and Ashton Barnitz, a seventh grade student and first year archer, shot a score of 277. In only its second year, the Wahama Archery Program consists of 13 middle school students from the seventh and eighth grades, and 13 high school students from the ninth through 12th grades. The team is led by Larry Gray, head coach, and Todd Grinstead, assistant coach, as well as associate coaches Tony Eblin and John Epple. The West Virginia Archery in the Schools program is managed by the Division of Natural Resources (DNR), Wildlife Resources Section. The National Archery in the Schools Program (NASP) is open to all schools (public, private, or homeschool) that teach NASP archery. Information submitted by Wahama Junior/Senior High School.